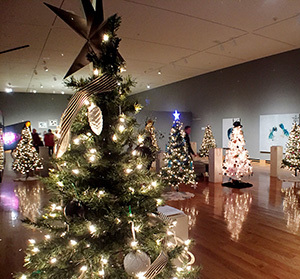 The University of Wyoming Art Museum will launch the holiday season with two free public celebrations, the Festival of Trees and the 25th annual Happy Holidays, Laramie!, Nov. 30-Dec. 2. The Festival of Trees and silent auction will feature trees and holiday items donated and decorated by student groups, civic organizations, local businesses and members of the community. During the “Lighting of the Trees” reception Thursday, Nov. 30, at 6 p.m., visitors can preview the decorated trees, enjoy refreshments and listen to musical performances by Laramie student groups. The silent auction will open for bids, and attendees can vote for the People’s Choice Award, which will be announced at the end of the evening. The silent auction continues Friday, Dec. 1, from 10 a.m.-5 p.m. and ends Saturday, Dec. 2, at 2:30 p.m. during Happy Holidays, Laramie! Bidders need not be present to win, and all proceeds benefit museum programs and children’s art classes. Happy Holidays, Laramie! will take place Saturday, Dec. 2, from 10:30 a.m.-3 p.m. The event includes musical performances by local choral groups, student musicians and a grand finale by the Laramie Community Band. Children are invited to have their pictures taken with Santa Claus and to create ornaments, cards and other holiday decorations. Happy Holidays, Laramie! also celebrates the opening for the holiday exhibition of artwork by Albany County schoolchildren, which will be on view through Saturday, Dec. 16. All events are free and open to the public, and will take place at the UW Art Museum, located in the Centennial Complex at 2111 Willett Drive. Happy Holidays, Laramie! and the Festival of Trees are sponsored by First Interstate Bank, John McPherson DDS, Laramie GM Auto Center, White’s University Motors, Scott McFarland Insurance Agency, UniWyo Federal Credit Union and American National Bank. For more information about these events, contact Katie Christensen, curator of education and statewide engagement, at (307) 766-3496 or katie.christensen@uwyo.edu. For more information about the Art Museum, call (307) 766-6622, visit the website at www.uwyo.edu/artmuseum, or follow the museum on Facebook. Through its “Museum as Classroom” approach, the UW Art Museum places art at the center of learning for all ages. Located in the Centennial Complex at 2111 Willett Drive in Laramie, the museum is open Mondays through Saturdays from 10 a.m.-5 p.m. Monday hours are extended to 7 p.m. February through April and September through November. Admission is free.